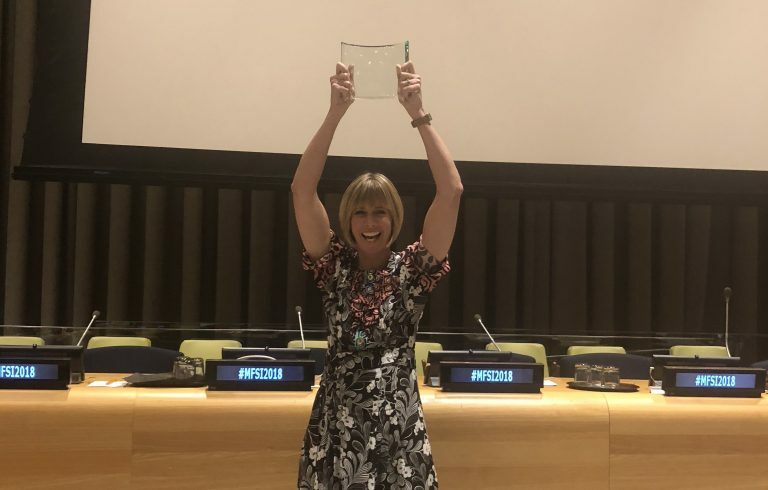 Edie Lush, co-host of the Global GoalsCast has received the 2018 Media for Social Impact Leadership Council Award at the United Nations, one of the highest honours awarded by the social sector for the media and technology industries. The award comes in recognition of her role as co-host of the Global Goals podcast which inspires action on the United Nations Sustainable Development Goals. Global GoalsCast shares the stories of individuals and organisations that are advancing a more sustainable world and aims to empower listeners to make the world a better place. Edie is an author, executive editor of Hub Culture, communication trainer and recognised media and technology journalist. She was formerly economics and political correspondent for Bloomberg Television, a columnist at The Week magazine and the associate editor of Spectator Business magazine. The Media for Social Impact Leadership Council is comprised of thought-leaders from their respective industries, and the award winners are nominated for this honour by their peers. Since its launch in January 2018 Edie and her co-host, Claudio Romo Edelman have published 13 episodes of the podcast, with guests including Nobel Prize laureate and female education activist Malala Yousafzai, seven-time Grammy Award winner and musician will.i.am and most recently HRH Princess Eugenie of York and her friend and colleague, Julia de Boinville about their campaign to end modern slavery through the Anti-Slavery Collective. Discussions on the podcast range from equality, innovation, climate change and major world events. Edie’s award was celebrated at the United Nations and PVBLIC Foundation’s Media for Social Impact Summit last Thursday. The summit provides a platform for individuals in the media and technology industry to collaborate with the United Nations in highlighting how the industry can drive social change to support global Sustainable Development Goals.